You Are Here: Home > How Long Do Brake Pads Last? The brakes are the most important safety feature of your car. Without them, you won’t be able to stop your car, and malfunctioning brakes can lead to serious accidents. The braking system is comprised of many different components: the brake pedal, brake disc rotor, and brake pads. If any of them start to go, that could limit the effectiveness of the whole system. That’s why you need to be mindful of each part’s longevity. If you’re curious as to how long brake pads last, you’re not alone. We’ll also explain how you can extend their life, and where to go if you need service near Stratham, Portsmouth, or Exeter. 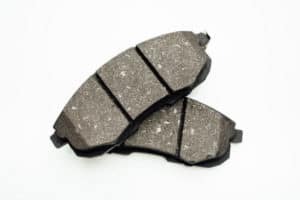 Read all about brake pads below, and don’t hesitate to contact us if you have any questions. Organic: Made from non-metallic fibers bonded into a composite material. Fillers get added to reduce noise and affect heat transfer. Semi-metallic: A mix of organic material and metals like steel, copper, or iron. They’re harder than organic pads and are more resistant to heat. Metallic: Formed from a mix of pressure-bonded metals. These were once used extensively in racing. Synthetic: Also known as ceramic pads. Made from a mixture of organic and nonmetallic materials, like fiberglass and aramid fibers. They’re stronger and last longer than the other brake pad types, but cost almost twice as much. As mentioned above, how you drive is a big factor in determining how long your brake pads will last. Driving really fast with sudden stops will burn your brake pads quickly. If your vehicle has a lot of cargo, that can affect the brake pads. 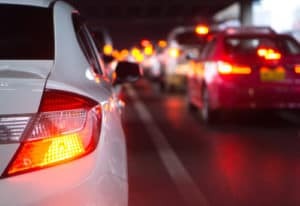 More mass means more braking power is needed to slow and stop your car. Furthermore, low brake fluid level or dirty fluid will eventually affect the brake pads. It’s recommended that you get the brake fluid flushed every 25,000 miles. To be certain, however, you’ll want to refer to your owner’s manual for the exact number. You’ll also want to consider which type of brake pad to equip your car with. For overall stopping power, go with the synthetic pads. For adequate braking performance, but maximum brake pad life, you can’t go wrong with semi-metallic. The brake pad type, combined with your driving style, could ultimately determine how long your brake pads will last. If you’re having any type of issues with your brake pads, then bring your vehicle to the BMW of Stratham Service Center. Our certified technicians are experts in all things brake pads. As a result, they can outfit your car with the right brake pads for your trips around Stratham, Portsmouth, and Exeter. Don’t wait. Schedule service with us today!